1. Using an ice cream scoop, form 8 large balls of the ice cream, and place on a plate or tray and return to the freezer, so that they are as frozen as possible. Meanwhile, take the slices of madeira cake and using a 6cm round pastry cutter cut into 8 discs, and set aside. 2. Make the passion fruit coulis, place all the ingredients with 4 tbsp water in a small pan and bring to the boil, continue to boil until the mixture has reduced to a nice thick, syrupy consistency, about 4-5 minutes. Allow to cool then refrigerate until needed. 3. Finally, make the Italian meringue, place the caster sugar in a saucepan and add a little water until a wet sand texture is achieved. Then heat the mixture and bring to the boil, continue to heat until the temperature reaches 118°C, then using a using an electric mixer start to whisk your egg whites on a medium speed. Once the sugar reaches 121°C, remove from the heat and gradually add the syrup to your whisking egg whites and increase to maximum speed. This will take approximately 5 minutes to whip up into a smooth, glossy meringue. Place this mixture into a piping bag with a star shaped nozzle, about 6mm or simply cut the piping bag at an angle and set aside. 4. To assemble, place the ice cream balls onto the sponge discs and pipe around the Italian meringue, smooth over with a palette knife so that none of the ice cream is exposed. Take the piping bag and pipe peaks around the Alaska starting from the bottom and working your way up to the top. Once all the surface space has been covered return to the freezer and leave there until ready to serve. 5. When you are ready to serve, Preheat the oven to 220°C, gas mark 7. Then place the Alaskas in the oven for about 5-7 minutes or until the meringue turns a nice golden colour then serve immediately. 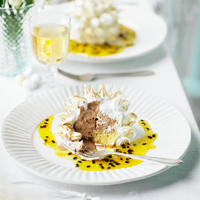 Spoon the passionfruit coulis on the bottom of the plate and place the baked Alaska on top.